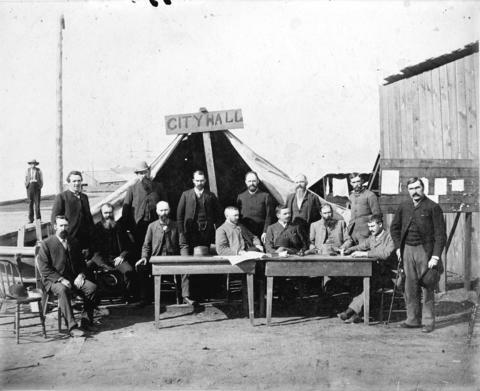 Photograph shows City Council members and officials standing in front of a tent with the sign "City Hall", after the fire of 1886. The men in the photograph are: (seated, left to right) C.M. Coldwell, E.P. Hamilton, J.R. Northcote, Mayor M.A. Maclean, L. A. Hamilton, P. Cordiner, City Clerk T.F. McGuigan; (standing, left to right) J. Griffith, R. Balfour, T. Dunn, City Solicitor J.J. Blake, J. Humphries, City Treasurer G.F. Baldwin, and City Coroner Dr. W.J. McGuigan. The empty chair on the left is for Councillor H. Hemlow, who was absent on business. The man standing on the wharf in the background is G.W. Gibson, founder of Gibson's Landing. Cropped version of LGN 1045.